Perspective is an interesting thing, a simple word that is bound to change your own views based merely on how you look at something. The actual “something” itself remains unchanged, but depending on the angle that it catches your eye (or ear) you may wind up judging it differently. So it is with the work of The Orioles, one of the most crucial rock groups of the 1940’s who at times sounded like they wanted to be one of the vital pop groups of a few years earlier. As we know all too well by this point, in the rock world that we inhabit this is never a good thing. Though rock music was rapidly picking up steam commercially and finding a waiting and eager audience for this music, its long term viability was still in doubt, particularly if its most promising acts coveted the respect and larger sales that mainstream pop offered. 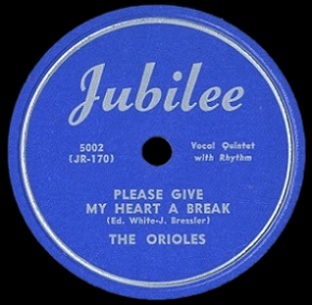 The Orioles, by virtue of two huge hits, the first of which from July 1948 added immeasurably to the sonic textures rock was building over its first year, were unquestionably among the leaders in the field as it moved forward. They were young and good looking with no professional baggage to shed in order to make it in this brave new world. Better still their initial hit perfectly conveyed the uncertainty about someone’s first foray into more adult relationships, something that reflected the equally young audience’s own experiences, forging a lasting bond between the two entities that could fuse their fates together going forward. Yet The Orioles also fell prey to a much longer lineage in the black vocal group tradition of modifying their natural instincts in an attempt to court the favor of the white adult pop community, one that surely looked down on their rock associations. That’s a tough position to put yourself in for two reasons, the first is you risk losing your core audience by abandoning what they like about you. The second of course is there’s no guarantee the pop world will embrace you even when you try desperately catering to them and their tastes. Hence we have another example of stylistic conflict that marked rock’s first few years because nobody involved was quite sure how secure a future they’d have by sticking exclusively to rock ‘n’ roll. Yet now, seven decades later when all of US know how that battle between musical genres turned out, we find their pop concessions to be an ill-conceived deviation from what they should’ve been focused on all along and we have to call them out on it even if those decisions at the time were far more ambiguous. 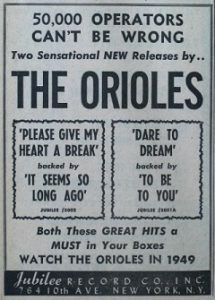 It’s February 1949 as this record comes out, the third by The Orioles in their brief career thus far, compromising five songs. Two of them scored with rock audiences attracted to the soulfulness of Sonny Til’s heart wrenching leads and the airy harmonies behind him on It’s Too Soon To Know and It’s Gonna Be A Lonely Christmas. Yet those two songs were initially designated as the B-sides in favor of a gimmicky novelty Barbra Lee and a tepid pop leaning ballad To Be To You which stirred no interest on their own. When the holidays passed and they decided to switch out the Christmas cut on the latter single for a more appropriate tune in January in an effort to extend their winning streak (and maybe get To Be To You another chance at being heard itself) they chose the insipid Dare To Dream, a song that was wrapped in a pop arrangement that obliterated the quality of Sonny Til’s vocal performance. This too would fail to connect with the rock audience who are far too astute to fall for such drivel designed to lure in their parents generation instead. You’d THINK they’d have learned their lesson by now, realizing that the marketplace was indeed changing and with that the long established ground rules were being upended by a new audience with new demands. Yet despite their abject failure each time they’ve tried to head in a more adult pop direction, and more incredulously in spite of their enormous success with the two songs that appealed to the rock audience first and foremost, they stubbornly continued to cling to the idea that this was 1943, not 1949, and so once more they aim squarely at an audience that couldn’t care less about The Orioles. Please Give My Heart A Break is another tender ballad, something Sonny Til unquestionably excelled at, but its dainty pop-lite arrangement undercuts his emotional commitment at every turn. Rock fans again sensed they were being dismissed by Jubilee Records and largely stayed away, while the slack certainly wasn’t picked up by the type of snobbish cultured music fan who they were hoping to entice instead. So that means the record is a total failure, right? Another example of people too unaware of what was going on around them to make an informed decision. A cautionary tale for artists in the future who allow those in control of their careers to steer the group into commercial and cultural irrelevancy by following the siren call of mainstream interest with increasingly desultory stabs at pop appeal. Well normally yes… but in THIS case anyway it depends at least somewhat on the context in which you hear it. When listened to on its own amidst the other rock fare we’re featuring this month Please Give My Heart A Break sounds woefully out of place. Not that it doesn’t belong in the roll call of rock releases, it does, but the record is certainly compromised in its intent by skewing far towards existing pop sensibilities. Because of that it fails to provide a suitable answer to one of the primary questions asked for each and every song covered here, namely “Does the record take rock as a whole in a direction it needs to go?”. While intentionally a fairly open ended question left to individual interpretation, the answer here is clearly “No” for the simple reason that downplaying the aspects which make rock unique undermines rock’s potential to speak for a new audience and carve out its own place in culture. In THAT context, one made even more evident when bookended in the release schedule by the likes of Wynonie Harris and Eddie Gorman who obviously aren’t aiming at pop audiences with their efforts, this record doesn’t have the same intrinsic appeal as the best rock releases… or even the average rock releases for that matter. It feels like an interloper. Yet when listened to a different context it fares a little better. By placing the song between the last Orioles side we heard in January, Dare To Dream, and the flip side of this record (still to come) It Seems So Long Ago, both of which have even more overt concessions to pop arrangements, then Please Give My Heart A Break sounds as if it’s genuinely trying to at least find a middle ground between their pop aspirations and the more soulful sounds they first drew notice with. But of course it’s the same record in both cases and presumably listened to with the same ears connected to the same brain which has presumably the same tastes, but it shows how much context plays a part in how we perceive it. So which will it be here? Do we see the glass as half full or half empty? Do we eviscerate the group along with manager Deborah Chessler and Jubilee’s Jerry Blaine for attempting to cross over and abandon their already fervent following, or do we cut them some slack for trying their best to navigate a still darkened road through the jungle of shifting commercial realities without benefit of a roadmap? I’m not really sure to tell you the truth. I wrote full reviews for Please Give My Heart A Break twice and the tone of them varied greatly. The first was written when I was initially compiling the basic playing order for February’s rock releases and in that company it got largely panned. I ripped into the uninspired piano/guitar opening that immediately placed this in the type of setting where customers sip, not swill their drinks, where patrons act demure rather than act up, where polite applause replaces rapturous cries of delight. I criticized the modest backing of the others which came off as being far too careful so as not to be noticed much. I questioned the goals of all involved for not giving a young audience desperate for idols of their own the chance to fully connect with Til by giving him material in which he had no choice but to hold in his emotions. In other words that review had a lot more censored f*#ks and d@mns and $hi+s in it. But then as I was posting the reviews for January 1949 I added Dare To Dream at the last minute mostly to focus on the topic of creative misdirection a little more thoroughly, I wound up listening to this song again – and truthfully, forgetting I’d already written about it – I sat down and wrote a far more sympathetic review because in comparison to that previous monstrosity this came across as a much more authentic effort. I suddenly found the virtue in Til’s restraint gradually giving way to more combustible yearning that releases itself in the “Oh-ohh-ohhh-ohhh!” heading into the bridge. I envisioned them singing this song trying to convince some girl who likely WAS too cultured for their sensibilities, but whom they really like and thus were trying to present themselves in the best light, to assure her that they weren’t uncouth hoodlums. It might’ve been a bit of a stretch to give them the benefit of the doubt down the line but I was at least willing to go on that premise rather than slay them completely for their modest aims. So THIS review is actually the third such effort, one that borrows pieces from both and attempts to come to a more reasoned decision that takes both views into account. Call it a compromise if you want, or accuse me of playing Devil’s advocate against myself, but what we’re left with is (ironically) a similar conclusion. Not in terms of grade but in terms of overall impressions. No amount of contortionist-like explanation is going to alter the fact that Please Give My Heart A Break IS compromised by its very intent. A record’s two components – the vocals and the music – need to work in tandem and when they don’t it’s always going to result in a rift that will pull the song apart at the seams, hurting the appreciation of it from both perspectives. The pop audience won’t like the more extreme aspects of Sonny Til’s emotional commitment while the rock listener will blanche at hearing that aspect housed amongst music designed for the cocktails and caviar crowd. There shouldn’t be much doubt as to where our interest lays. In songs like this which are so reliant on the lyrics connecting with the listener you need to be able to determine if the sentiments he projects are real, or merely a performance. With the piano seemingly unconcerned with the veracity of what he’s singing, but instead trying to dress it up for a classy audience, the conflict undermines Til’s believability enough to have you question it. The more you notice the accompaniment – something bound to be more evident when sandwiched between songs who are backed by more appropriate rock musicians, honking and squealing and stomping on the beat – the more the mild facets of this record will hamper your enjoyment of it. But if you can largely ignore the piano, or preferably if you hear it alongside even MORE inappropriate playing such as on the other Orioles sides from this time, then your appreciation for what Til himself delivers grows enough to overcome your strongest reservations and not give up on the group altogether, even as they seem bound and determined to intentionally frustrate you each time out. Because this song never chooses a side however it never give us a definitive answer as to who among us they’re trying to win over, thereby all but assuring that nobody listening will be won over completely. Leave a reply on "The Orioles: “Please Give My Heart A Break”"